In a bid to promote clean fuel, the Municipal Corporation of Gurugram (MCG) is planning to add more than 100 electric buses to the public transport system. 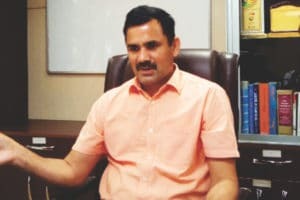 The Haryana Government is also motivating bureaucrats to use electric cars, says Yashpal Yadav, Commissioner, MCG, in conversation with Gautam Debroy of Elets News Network (ENN). Gurugram was at the 105th position in the latest Swachh Sarvekshan. What initiatives are you taking to improve this rank? Compared to last year, we have improved our rank in the survey and are continually working hard to improve it further. For us, ranking does not hold much importance and we strive hard to provide best facilities to our citizens. We want our citizens to feel satisfied with the given facilities. We also seek to make our city better with improved infrastructure. We are putting in our best efforts to improve four basic facilities: drinking water, electricity, sewage, and roads. What methods have you applied to improve waste management in the city? We are already an Open Defecation Free (ODF) city. Now we are going for the ODF++ ranking. We are creating more public and community toilets and are doing awareness campaigns to motivate people to use them. One of the key components to keep the city clean is solid waste management. We are trying to provide the door-to-door garbage collection facility and are also encouraging the composting of wet garbage. Waste from construction and demolition activities is also a big problem in our city. We have already started making facility to process the same. We are also looking for options to set up a mobile CNG waste plant where we can take the plant to the garbage dump itself. We want to recycle the entire waste and reuse it. What role can private players play to make the city clean? If every individual starts listening to what Prime Minister Narendra Modi is saying on cleanliness, the city would automatically become clean. We need support and cooperation of every citizen of the country. If we imbibe a habit of not throwing the garbage carelessly, then the city would easily become clean. Citizens are coming forward and companies are providing help under various initiatives under their Corporate Social Responsibility (CSR) initiatives and helping us in capacity building. Transportation is a major issue in Gurugram. What initiatives have been taken to improve this situation? City bus services have already been launched and new buses are being added every month. In the coming months, we will be able to cater to the entire city and it will be a milestone as far as public transport is concerned. The Government has already rolled out a plan to expand the Metro. There is a proposal to introduce taxi services in the city. Are you planning to incorporate electric vehicles in your public transport fleet as well? More than 100 electric buses will be added to the public transport system. The Government is also motivating bureaucrats to use electric cars. What steps have you taken to improve the security of citizens in the city? We recently organised a seminar and reconstituted a committee to look into this aspect. Complaints can be lodged with the committee which will take appropriate action against the accused. What other steps have you taken to enhance the security of the city? We are working in close cooperation with the Haryana Police. Whatever support Haryana Police requires, we are providing them. Recently, they requested vehicles from the Corporation so that they can strengthen their presence in the city. We have made a proposal to provide 50 vehicles to them. These vehicles will also help them in doing night patrolling. What challenges do you face as a Commissioner? There are two major challenges. The first one is proper disposal of solid waste and the second one is providing citizens basic services and their upkeep. We are planning a long term solution which will solve the waste problem. We are already developing a plant to take care of waste in the city.